The pictures taken at the SLFP’s Darley Road headquarters on Wednesday have a déjà vu quality about them. Mahinda Rajapaksa sits at the head of the table, in the biggest chair in the room. He is flanked by the two General Secretaries of the Sri Lanka Freedom Party (SLFP) and the political coalition it leads, the United People’s Freedom Alliance (UPFA). In one picture, SLFP General Secretary Anura Yapa stands like a sentinel on Rajapaksa’s left, a slightly deferential air about his posture. “It’s been six months since I’ve been here and met the press,” boomed the former Preside nt, who was ousted by 400,000 votes in the January election he had himself, in his infinite wisdom, declared two years ahead of schedule. 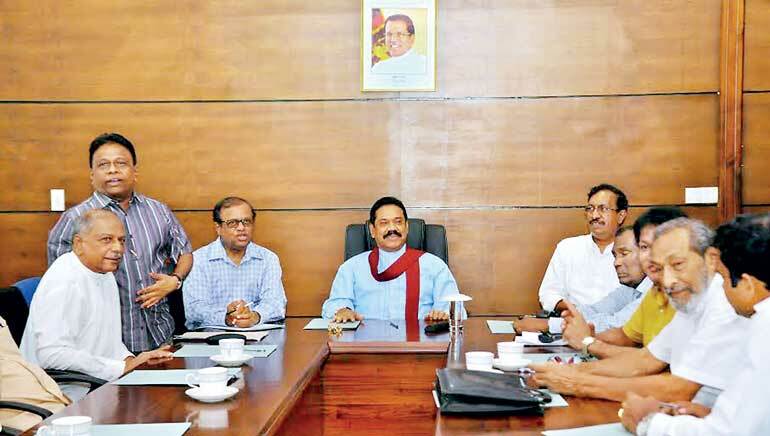 The meeting ‘chaired’ by Rajapaksa took place the morning after President Maithripala Sirisena’s blistering speech against the ex-President’s candidacy, and his prediction before the nation that Mahinda Rajapaksa would be defeated again in the 17 August election. The meeting at Darley Road on Wednesday morning was an act of defiance against the President who had demanded the meeting be cancelled. As Chairman of the SLFP, President Sirisena also holds the mantle of UPFA Chairman, yet the General Secretaries of both these parties stood beside the ex-President, in a defiant show of solidarity. The SLFP is livid about the President’s address on Tuesday, in which he disassociated himself from the decision to grant Rajapaksa nominations from the UPFA. The remarks took the wind out of the party’s sails, because SLFP seniors had been crowing for days about a rapprochement between President Sirisena and his predecessor. Convinced that Rajapaksa would bolster its chances against the UNP, but eager to cling to President Sirisena’s popularity and piggy-back on his mandate for good governance, SLFP seniors tried hard to play happy families. President Rajapaksa himself appeared to play into this strategy, telling international news services that he was “leading the campaign with President Sirisena as the Chairman of the party to form a Sri Lanka Freedom Party-led government”. It may have come too little too late, but President Sirisena’s speech exposed the deep rifts within the SLFP and the UPFA, demoralising party cadre and throwing the Opposition campaign for the 17 August election into severe disarray. The President moved to strike again on Wednesday soon after the UPFA held the meeting against his orders, with Sirisena loyalist Prasanna Solongaarachchi filing a motion in the Colombo District Court seeking to put an end to SLFP Central Committee and UPFA Executive Committee meetings without the explicit sanction of the Party Leader. The injunction issued by court forced Yapa to cancel the Central Committee meeting scheduled for 8 p.m. on Wednesday against the wishes of President Sirisena, and the SLFP was at war. The picture from Darley Road tells a story that has been unfolding since President Sirisena took over the reins of his beloved Sri Lanka Freedom Party and former President Rajapaksa began plotting a political comeback. Days after he lost the election to his party’s former General Secretary, Rajapaksa also lost the mantle of SLFP Chairman to his successor Maithripala Sirisena. Frightened party-men, hoping against hope to remain in Government, decided to close ranks with the new President and ask their defeated leader to step aside. President Maithripala Sirisena, the SLFP’s longest-serving General Secretary, an old faithful with a 48-year political career in the party, was elevated to leadership. It was a mantle the President cherished, loyalists say, because his love for the SLFP ran deep. Frustration at Rajapaksa handling of the SLFP and the way the former President sidelined old hands and favoured newcomers defecting from other parties had played a role in Sirisena’s decision to contest Mahinda Rajapaksa for the presidency. When Sirisena won the presidential race, his victory was interpreted as the moment when the State was reclaimed by its citizens from the jaws of an increasingly-authoritarian political dynasty. Sirisena’s appointment as Chairman of the SLFP was also supposed to signify the reclamation of the party by its old guard, whose political philosophy differed from the ultra-nationalistic Rajapaksa vision for the centre-left party. An illusion was constructed that day in January, in the euphoric aftermath of the Rajapaksa defeat. President Sirisena thought his SLFP colleagues would rally behind his leadership and help him to reform the party and take it back to its sangha-wedha-guru-govi-kamkaru roots. He was perhaps justified in this assumption. For years his SLFP colleagues had complained loudly about President Rajapaksa’s iron grip on power and the meteoric rise of Rajapaksa family members within the party. President Sirisena was no usurper or ‘parachute’ politician, but a true-blue faithful, often touted as the natural choice for premiership during the Rajapaksa presidency. Initially SLFP seniors claimed Sirisena for their own, even after they had eagerly approved his ouster as General Secretary in November, when he quit the Government to challenge Rajapaksa’s third presidential bid. “Our Party Chairman contested our Party General Secretary for the presidency. The Chairman lost, the General Secretary won, that’s about all that happened,” SLFP members who switched allegiances within hours of Sirisena’s inauguration told reporters at his Wijerama Mawatha residence. They appeared to have forgotten that the General Secretary had been expelled from the SLFP and his replacement appointed long before election day in January. The reality was that SLFP support for President Sirisena was not based on ideology or a desire to right the wrongs suffered by party stalwarts over nine long years. Intensely feudal in mentality, SLFP members merely sought to gravitate to the next centre of power, after what they thought was the end of the Rajapaksa story. By claiming Sirisena as their own, the SLFP thought the President would shed the UNP and install the party’s senior leadership in his Cabinet. The SLFP wanted the premiership and ministerial positions and they were unwilling to share that space with Ranil Wickremesinghe’s UNP. For nearly 20 years SLFP seniors had held ministerial office, commanding fleets of vehicles and large security contingents. With the President installed as SLFP Leader, it seemed only natural that he proceed to govern with an SLFP Government. When weeks went by and President Sirisena failed to comply, the SLFP-led UPFA began to flex its muscles. In the veins of the true blue SLFPer runs a deep hatred of the UNP; a hatred that, party activists explain, trumps all other considerations. To the SLFP rank and file and its stalwarts, President Sirisena had committed a double sin. Not only had he broken ranks with the party and allied with the UNP to win the presidency; but he had eschewed the SLFP in favour of a UNP Premier and Cabinet of Ministers. SLFP MPs inducted into the Sirisena Cabinet in the hope of buttressing his Government’s legislative clout never managed to get comfortable with Wickremesinghe at the helm. They abused the Prime Minister and hailed the President publicly and seethed at Cabinet meetings when Wickremesinghe took the lead on policy issues. President Sirisena never admonished his SLFP Ministers or even expressed his regrets about the fact that the two parties that were trying to govern together for the first time just could not seem to get along. In fact, President Sirisena who deals with his own fundamental antipathy to the UNP, may have even sought to encourage the tensions, highly-placed sources say. The President’s passivity in the face of SLFP rebellion against his Prime Minister was actively encouraged by a close cabal of aides who had built a wall around President Sirisena over the past several months. Minister Rauff Hakeem, when he addressed Parliament during the adjournment debate on the 20th Amendment, highlighted this development, when he made references to a certain ‘kitchen cabinet’ that was strongly influencing the President. The members of this tight circle that had surrounded President Sirisena included certain JHU ideologues and former UNP members turned presidential aides who were strongly antagonistic of UNP Leader Ranil Wickremesinghe. This group, the Daily FT learns, had a deep impact on the President’s thinking and his decision to lend quiet encouragement to the SLFP campaign against Wickremesinghe that was backed strongly by the pro-Rajapaksa faction within the UPFA, including Dinesh Gunewardane, Wimal Weerawansa and Vasudeva Nanayakkara. The ‘kitchen cabinet’ was strongly favouring a postponement of the Parliamentary election. The JHU ideologue within this group was largely responsible for the 20th Amendment, a bill that was poorly drafted and failed to accommodate the basic principles of proportionality and representation that would ensure the enactment of meaningful election reform. The 20A was touted as the main reason for delaying the dissolution of Parliament, and the electoral reform legislation was believed to be an SLFP project aimed at delaying an election the party was sure to lose. President Sirisena was repeatedly assured by his close-knit circle that he did not have to defer to his Prime Minister on all matters of governance. The group also drummed it into President Sirisena that an election called too early would be highly beneficial to the UNP, which could even have polled enough votes for a two-thirds majority. Having lived through President J.R. Jayewardene’s five-sixths majority while in opposition, President Sirisena was well-schooled in the dangers of a too-powerful UNP. Ultimately it did not take much to convince him that a delayed election may in fact be a good thing. If the SLFP could regroup and the UNP’s popularity waned, President Sirisena was led to believe he would have a more manageable Parliament, with Wickremesinghe’s UNP unable to call all the shots. The passage of the 19th Amendment to the Constitution was the shining moment of President Sirisena’s 100-day program. Many other promised reforms never saw the light of day. Tough battles had ensued with the SLFP to preserve the spirit of the amendment – aimed at curbing presidential powers and restoring independence to key institutions of the State. Public euphoria about the passage of 19A proved that the Government was at its peak of popularity. The victory was seen as a reversal of Rajapaksa machinations to turn an already powerful presidency into a dictatorship and reinforcement of the values fought for at the 8 January presidential election. That victory was never truly complete, political observers say, because it did not usher in a new Government to reinforce the mandate. The 8 January election was not an end in itself. The second part of that ballot box revolution would unfold only at a Parliamentary contest to elect a majority that best reflected the mandate for constitutional reform and good governance expressed on 8 January. It made little sense therefore for President Sirisena to delay that election. The UNP needed a majority to govern without a Damocles sword over its head, and the President needed a Parliament that would not fight him all the way on reforms he had promised the people. President Sirisena’s need was, if anything, greater. He desperately needed a Parliament consisting of fewer Rajapaksa loyalists, who were determined to unseat him and reinstall his predecessor’s autocratic regime. Influenced by his ‘kitchen cabinet’ and reluctant to call an election his party would lose badly, President Sirisena dithered on dissolution. He thought the two-month delay would help him to consolidate support within the SLFP and weaken Wickremesinghe’s Government ahead of the election. Unfortunately for President Sirisena, the political ‘nonagathey’ period born of his delaying tactics opened up a vacuum that the Rajapaksa camp managed to exploit splendidly. Plotting and planning at the Abayaramaya temple in Narahenpita, the ex-President’s team used the two months since 27 April to craft his comeback strategy. At first party seniors were nervous to participate in the ‘Bring Back Mahinda’ campaign. But months passed and the rallies calling for President Rajapaksa’s return as Premier gained momentum. Suddenly there were whispers of SLFP seniors colluding with the Rajapaksa camp to scuttle President Sirisena’s reforms and destabilise the minority UNP Government. The chief suspect in these negotiations was Susil Premajayantha, who held the all-important title of UPFA General Secretary, and therefore the key to nominations from the alliance. Once the Rajapaksa camp won over Premajayantha, their battle was three-quarters won. On Tuesday, President Sirisena exposed a plan by the UPFA to defeat Wickremesinghe through a no-confidence motion and bring Mahinda Rajapaksa in through the National List. Premajayantha would be integral to that plan. The UPFA General Secretary slammed President Sirisena for that revelation, saying that there was no provision to bring Rajapaksa into Parliament that way since he was not on the original 2010 list of UPFA nominees for National List seats. Since Rajapaksa did not contest in the April 2010 Parliamentary election either, he had no mechanism to enter Parliament through the national list, Premajayantha said. This is however a misrepresentation of the facts, even though the argument is constitutionally sound, lawyers say. In 2007 and 2008, President Rajapaksa nominated both his brother Basil and Karuna Amman to fill vacancies on the UPFA National List, even though neither were on the original 2004 list submitted to the Elections Department that was compiled by then President Chandrika Kumaratunga. Neither nominee had contested and lost the 2004 Parliamentary election to make them eligible for the seats through that provision. In the days leading up to 3 July, when President Rajapaksa’s candidacy was formally announced, Premajayantha and his SLFP counterpart Yapa rounded on the President after the UPFA Executive Committee meeting on 30 June and insisted that Rajapaksa was the choice of a majority of SLFPers and clearly had the support of the entire UPFA except the JHU. Trying to play a Machiavellian game aimed at keeping the UNP in line and appeasing his own party to wean them away from Mahinda Rajapaksa proved to be a dangerous gamble for President Sirisena. His failure to consolidate his position within the party soon after taking over the party leadership made him powerless during the nominations period and hostage to the ex-President’s manipulative skills. President Sirisena’s aides say he should have moved to remove the two General Secretaries of the SLFP and the UPFA earlier and appointed his own loyalists in those key positions to ensure control during the election campaign. That mistake has proved costly. On Tuesday President Sirisena was forced to predict the defeat of his own party’s main candidate and threaten to withhold the premiership from Rajapaksa, even if he should win the election. The remarks have badly damaged the Rajapaksa camp’s momentum, but it has also severely jeopardised the election fortunes of all Sirisena’s remaining loyalists inside the coalition. With the UPFA now determined to sideline the President and back Rajapaksa’s leadership of the polls campaign, Sirisena loyalists have been left in the lurch. Ironically, it was Sirisena’s staunchest supporters within the UPFA who suffered the greatest from his failure to block Rajapaksa’s candidacy, forcing them to join the UNP and contest the August election under the elephant symbol. Yesterday, three SLFP members holding deputy ministerial portfolios resigned in disgust over President Sirisena’s speech. The President’s Fisheries Minister Mahinda Amaraweera is also threatening to resign and quit the Parliamentary race. Duminda Dissanayake, the UPFA’s Anuradhapura District Leader and strong Sirisena ally, will not participate in the party’s maiden rally in the historic town today since Mahinda Rajapaksa will be the star attraction at the meeting. Once again, it is President Sirisena’s friends who have suffered most from his decisions. With his pledge to remain neutral at the election, pro-Sirisena SLFP members will be sidelined and have their party funds slashed as Mahinda Rajapaksa engages in a desperate attempt to wrest back control of the alliance. SLFP activists say the party is in deep crisis, likely now to be embroiled in legal tangles and leadership struggles that have become the hallmark of the party’s stints in opposition. President Sirisena’s speech on Tuesday was a desperate attempt at redemption. Deeply wounded by intense media attacks and calls of ‘traitor’ by his loyalists, he summoned his customary humility and quiet resolve to offer a lengthy explanation about his actions. “No other president has been attacked the way I have been attacked these past two weeks. I am happy about that. That to me is democracy in bloom. The floodgates of democracy have been opened in this country,” President Sirisena said, his eyes glistening. This is a president, his aides say, who is deeply affected by public opinion. He insists on monitoring social media and the mainstream press to determine his standing and appraisal of his performance in the public eye. His words on Tuesday sought to restore public faith in his leadership that was put to serious test at the thought of their hero turning their revolution on its head. Presidential loyalists who joined the common UNP-led alliance say the sense of betrayal felt across the country by Sirisena’s decision to grant his predecessor a nomination had been mitigated somewhat when he finally broke his silence after 10 long days. For others, the explanation had come too long after the die was cast. Whatever the President may say now, before the voters have had their say, he will find it extremely difficult to deny Rajapaksa the prime ministerial slot if the UPFA wins a majority on 17 August. This is an increasingly unlikely prospect now, with the President having made his position clear and eroding the UPFA of any legitimacy it might have laid claim to with Sirisena at the head of the party’s campaign. But the path had already been paved for President Rajapaksa’s re-emergence. If the ex-President leads the UPFA to victory and secures the premiership, President Sirisena cannot be entirely absolved for his role in the comeback. The President may have been trying to be a democrat about internal party matters, but if his passivity leads to the triumph of profoundly anti-democratic forces and reverses the citizen’s gains made since January, Sirisena too will be named as stakeholder in that process. President Sirisena said he had finally agreed to the Rajapaksa candidacy in order to prevent a major split in the party. The SLFP split anyway and the President looks increasingly isolated within the alliance. If the UPFA wins, there is little doubt Sirisena will be edged out and Rajapaksa returned as party leader. But Sirisena must hold his nerve because if the party loses, the SLFP will come scurrying back to him for protection. That may well be President Sirisena’s historic opportunity to undertake serious reforms in the SLFP, and see his vision for the party as an inclusive, credible alternative fulfilled. His speech on Tuesday made it abundantly clear that President Sirisena was powerless within his party and probably has been since he took over its reins in January. Fortunately for him, the admission of that powerlessness has proved endearing to a public fed up with macho strongmen in positions of political power.